In order to process your contributions efficiently, it's very important that the pictures are correctly named. You must use Coollector to have the exact name. Coollector will COPY the correct name into the clipboard, and then you'll be able to PASTE it back from the Clipboard (using Control + V, or Command + V on a Mac). 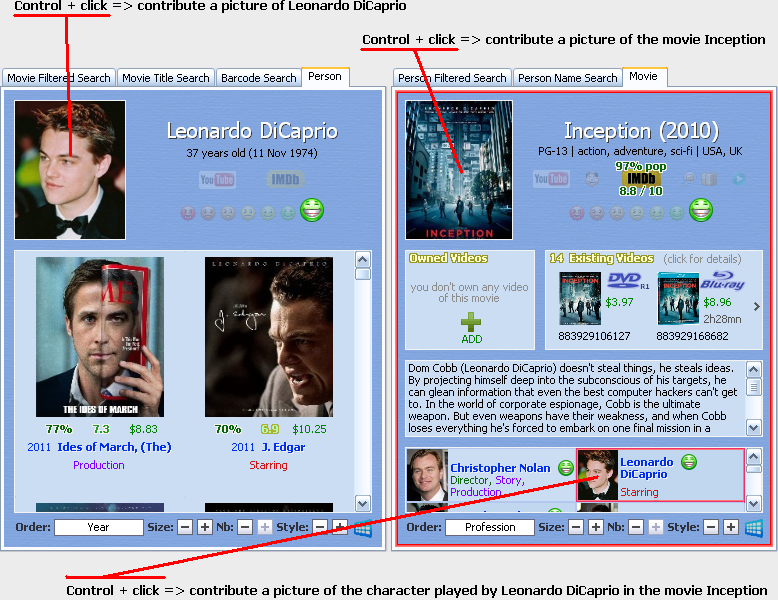 For Coollector to copy the name into the clipboard, you must press Control + click (Command + click on a Mac) on either the movie picture, or the person picture, or an actor in the movie cast. Send the largest picture that you have (we'll resize it or crop it if necessary). And of course, we can't accept watermarked pictures. Last edited by (cool) Hector on Fri Aug 13, 2010 8:11 pm, edited 14 times in total. When I control & click on any of these three areas all my computer does is open a google search. I am trying to get the numerical filenames so I can cut & paste them to the pictures I have but I can't bring them up. What am I doing wrong? What you haven't realized, because it's invisible, it's that Coollector has placed the correct file name inside the clipboard. You can now paste from the clipboard by pressing CONTROL + V. You'll do that to give the right name to the picture when you'll save it to your disk. Awful Nice artwork was missing and I could not manually add it to my collector so I thought to upload it and maybe this will help clarify how to contribute. Thank you! I've added it, it's now online. If it doesn't show on your computer, you might have to restart the program. Yes, you have to contribute it, for the benefit of everyone. maybe this will help clarify how to contribute. Please note that it's important to correctly name the pictures, as explained above (Control + Click... clipboard... etc... please ask me if there's something difficult to understand). It is almost completely clear now except the naming of the picture.Where did you get  in the name? Where did you get  in the name? You have nothing to do to get the correct name. As soon as you control + click, the program puts the correct name into the clipboard, in this case "Awful Nice (2013) .jpg". If you have the picture on your disk, it doesn't have the right name, so you have to rename it. Go to rename it, and instead of typing a new name, you'll type control + V to paste the value from the clipboard. If you find the picture on the internet, at the moment of saving the picture to your disk, the browser will let you decide which name you want to give to the picture file. you'll control + V to save it with the right name from the clipboard. As you can see, it's easy on your side (once you've understood), and it's much easier for me too to process your contributions. how do i know which person in the database that already has a picture yet? Why do you ask this question? Aren't the pictures downloaded while you use the program? Control + C => copy to clipboard. Control + V => paste from clipboard. When you contribute a picture, Coollector puts the right file name into the clipboard for you. You just have to rename the picture using Control + V so the picture has the right name. The artwork for Bandslam is incorrect. Could someone please correct it. Thank you. The artwork for Bandslam is incorrect.